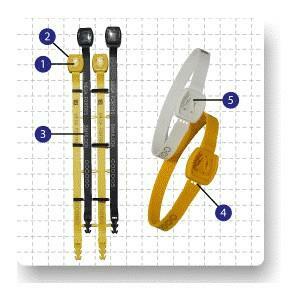 Simulock is an easily applied, fixed length, plastic ring, security seal. Its unique clear inspection window, allows quick visual inspection of the locking mechanism to verify integrity. It has a wide variety of applications, including tankers, trucks, railcars, roll cages etc. Ultrasonically welded to seal body. Permanent laser marking of name and sequential numbers. Built in weak point with security breaking lines. Allows quick verification of integrity. Cannot be cut or forced open without evidence. Laser marking cannot be removed and replaced. Custom laser marking is now available within 5-10 working days. Permanent laser marking available with name/code and number. Tankers - bulk food & liquids.